i changed the layout finaly!! do yu like it?! i hope you guys arnt on a mobile so you see my awsm cursor too!!! And the sparkly cursor is making me laugh so hard what have you done. Gosh I love this cursor. So sparkly. So pretty. XDDD Happy April 1st!! HAH! Perhaps I went a bit overboard. It's hurting my eyes! HAHAH I know the feeling. I seem to be safe from Shadowfury...For now. But the pink has definitely started to bother my eyes, hahah. I am so happy it's just April Fools day. I was actually scared that I was banned for a second when I was redirected to ShadowFury. ...Mwahaha! At least I didn't pull this on a Friday, eh? Eh? The red plague doctors are what? The new layout looks nice and is sooo pink. I love awesome cursors with sparkley goodness!!! I thought it was just ComicFury that was going fabulous, but now you, too? That was very conveniently timed, Benjamin. HAHA! Max KAWAII, Clanjack. Max KAWAII. For reals, Benny boy asks the important question and then interrupts the answer. Benny boy, pls. Edit: Okay, I'm STILL playing with the cursor! IT'S SNOWING SPARKLES!!! Magical fairyland! HAH! Benny boy and Felix as fairies...Oh, what a thought. Love the layout. very fitting for the general tone of the story. I feel like the cursor is allowing me to navigate your page as well as grant wishes to children who believe. are what!?! are what!?!? Cursor is too much fun. take it away from me. please. I have a problem. HAHAH! Yeah, I agree, the cursor is damn addicting. Every time I come here to respond to a comment or whatever I end up playing with it! Ha! nice prank. 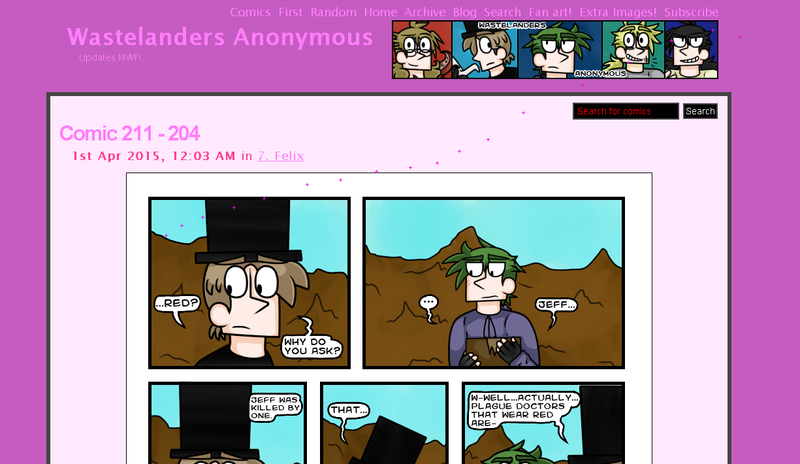 For the first 2 minutes I was paying attention to the comic and didn't even notice the site changed color. Heheh, thanks! Since it fell on an update day, I didn't wanna screw with the comic itself, heheh. Really? That's a shame! There was a few CF ones I ran into (like Vince commenting "excuse me" on 140ish pages), and then the whole ShadowFury thing...Heheh. I like your new banner Sea!!! Plus. you are dragging out your last pages cliffhanger and adding another one on top of it. Nice. Plus, very nice prank too. You should have left it that way until the next page went up, and pretended everything was cool. It'll be settled soon enough, at least, hahah. Ah, thank you! T'was a fun one! I considered leaving it up, but I wasn't sure if it'd be cool to leave an April fools prank up past April first or not, heheh. I do miss that cursor though, that was fun. You always do this to us you- "heres a little information" us-"FINALLY" you-"AHHAHAHAHAA im JOKING" *under lighting to look evil* " Youll NEVER KNOW"
Ahh, yes! The sparkles were glorious! I kinda miss 'em! HAH! Yeah for real Ben. Totally your fault...Heh. "Get down, a bunch of live-action humans are watching us!"